Ayotzinapa Families Bring Their Struggle to the U.S. This week a dozen mothers, fathers, classmates, and teachers of the 43 disappeared students from the Ayotzinapa teacher's college are launching a major tour to bring their story and demands for justice to 45 cities across the United States. March 26th will mark six months since the students forcibly disappeared in Iguala, Guerrero in September. This atrocious attack set off a crisis that now pits Mexico's ruling elites against a powerful justice movement that directly questions their legitimacy. Parents of the Ayotzinapa students march in Mexico City on February 26. Just six months ago, Mexican President Peña Nieto was riding a seemingly unstoppable wave of political success. He had repeatedly convinced super majorities in both houses of Mexico's congress to pass sweeping, investor-friendly amendments to the Federal Constitution and then rammed ratification through state legislatures. But Peña Nieto's winning streak came to a swift halt last October amidst growing rage over the disappeared students, and suspicions that local police and military were responsible. Enormous marches and protests, led by the families of the Ayotzinapa disappeared garnered massive support. Calls rang out for Peña's resignation. But that wasn't all. The president's standing was also tested by reports unmasking an Army cover-up of the June 30, 2014 Army massacre of 22 unarmed detainees in the town of Tlatlaya -- in the president's home State of Mexico. Then came charges that luxury housing was given to Peña's wife in exchange for favors to foreign investors. The shock waves from Ayotzinapa spread far beyond Mexico. Demonstrations in support of the Ayotzinapa families -- mostly led by Mexicans living abroad -- were held in dozens of cities across North America as well as in capital cities in Europe and South America. For a few weeks last November and December, Peña Nieto stumbled and seemed politically vulnerable in ways modern Mexican presidents seldom have. But then President Peña Nieto got a reprieve. He visited President Obama in Washington on Jan. 3, where, in an open attempt to restore business as usual, the Ayotzinapa case and all the thorny issues surrounding it were avoided. But under intense pressure prior to the DC trip, President Peña Nieto had agreed to a high-level, independent, on-the-ground investigation by the the Inter-American Human Rights Commission (IAHRC) which -- importantly -- has a Mexican General Secretary for the first time in its history. IAHRC General Secretary, Emilio Álvarez Icaza was a leader in and strategist for Mexico's Movement for Peace with Justice and Dignity (MPJD) just prior to taking on the IAHRC job. The impressive team he assembled arrived in Mexico on March 1 with a mandate to thoroughly investigate the Ayotzinapa case and to look more broadly at the tens of thousands of enforced and other disappearances that have shaken Mexico in recent years. 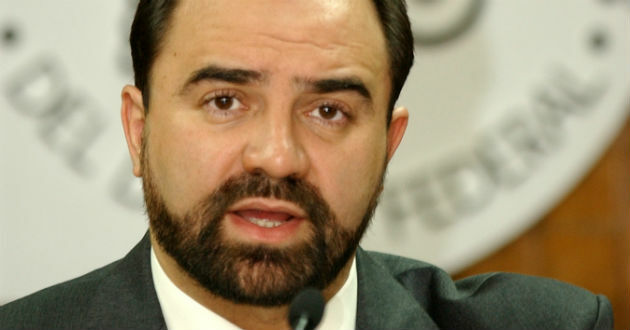 Emilio Alvarez, General Secretary of The Inter-American Human Rights Commission, is a Mexican with a formidable background in human rights advocacy. The presence of the IAHRC mission puts President Peña Nieto in a bind. So do the findings of the highly respected Argentine Forensic Anthropology Team that has worked alongside the parents for months. In public, the president must respect and even support these genuine efforts to dig for the truth. Behind the scenes, however, the shadow powers of the business and security elite that keep President Peña Nieto in power can't afford to cooperate. They are not big fans of truth and justice, because they have a lot to hide. The business and security elites would rather have authorities stick with the traditional approach to politically charged cases in which investigators manipulate and destroy evidence, coerce testimony, manufacture false scenarios, and generally create enough confusion to secure doubt and impunity. That is how the murders of hundreds of students by Army units acting on presidential orders were covered up in 1968 and it continues to define how egregious official transgressions are handled today. 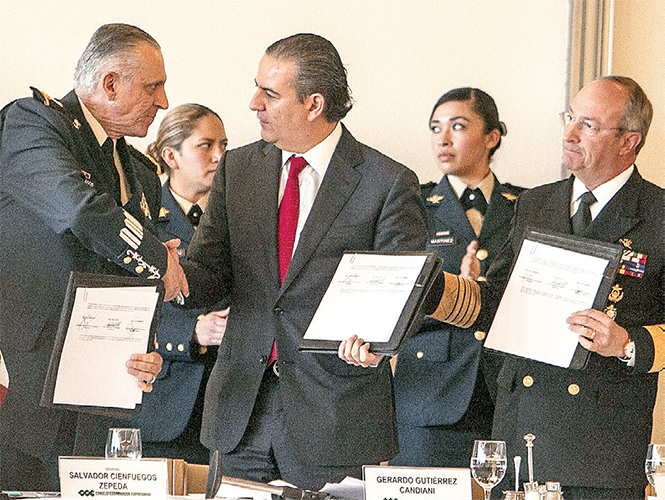 On February 14, Gerardo Gutiérrez Candiani, the president of Mexico's most influential business group, the Consejo Coordinador Empresarial (CCE) met with the heads of Mexico's Defense Department and Navy to sign an accord expressing business community support for the Armed Forces. More explicitly, the CCE directly interfered in the Ayotzinapa case by supporting the Army's refusal to allow Ayotzinapa parent-investigators onto military bases. During the meeting, Mr. Candiani praised the Armed Forces for doing things "that are not in the Constitution, but that are indispensable to our security as Mexicans." Valentines Day Handshake: Gen. Salvador Cienfuegos, Defense Secretary for Enrique Peña Nieto's Government shakes hands with CCE President. At right: Navy Secretary, Adm. Vidal Francisco Soberón. Last fall, Global Exchange joined the calls of many other human rights organizations, commentators, newspaper editors and others around the world asking Mexico's authorities to break the habit of impunity and to conduct an honest and thorough investigation of the disappearances of the 43 students. Such an investigation would evaluate whether there was any Army or Federal Police involvement during or after the coordinated attacks on the students. The attacks took place at multiple sites across the city of Iguala, over the course of several hours -- in the immediate vicinity of a regional Army headquarters -- on the night of September 26th. Photos released three weeks ago indicate that the army definitely had contact with the students on the night of the disappearances. Attorney General Murillo Karam who led the official investigation (until his resignation in February) did order the arrest of more than 90 people, 22 of them Iguala Municipal Police officers identified by students. Yet despite the large number of arrests, Murillo Karam presented a case (that he arrogantly dubbed "the historical truth") based on the testimony of just four of the detainees. These four -- all purportedly members of the local Guerreros Unidos gang -- have allegedly confessed to murdering the students and then incinerating all 43 of their bodies in a massive bonfire in the rain. The Argentine forensic team has steadfastly refused to corroborate the government version or certify the unverified "chain of custody" of the single bone fragment shown to have a DNA match with one of the missing students. A confrontation looms. As the IAHRC investigation proceeds, the government is soliciting foreign bids (for the first time since 1938) to drill for Mexican oil deep under the Gulf of Mexico. The investor class is eager to paint the Ayotzinapa movement as radical and dangerous to scare away its supporters. Meanwhile, questions loom over the fate of tens of thousands of other missing people across Mexico. For each one of the 43 missing Ayotzinapa students there are more than 500 others who have been disappeared. 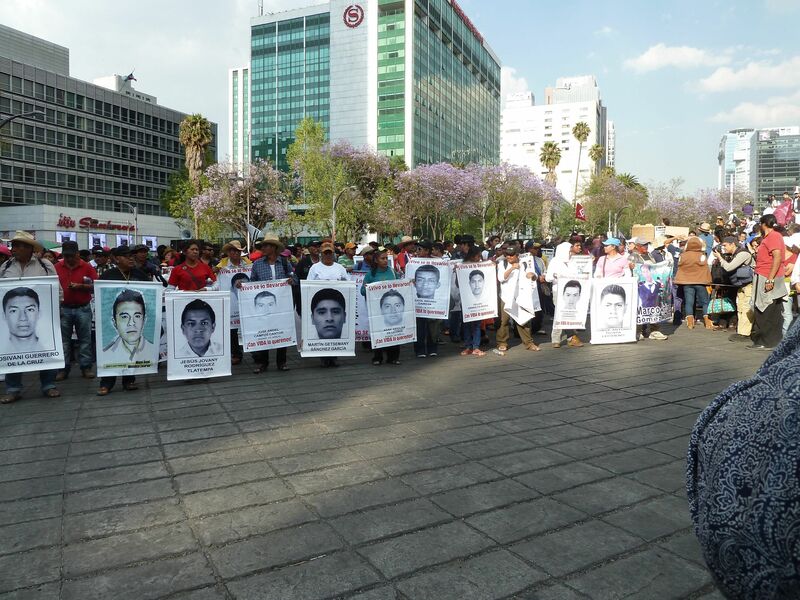 Even in Iguala the 43 abducted students are not the majority of those missing. A new group calling itself Committee of Families of Forced Disappearance in Iguala, "The Other Disappeared", (Los Otros Desaparecidos) has organized in Iguala, and already counts more than 300 families with disappeared loved ones amongst their members. The group searches the hillsides of Guerrero every Sunday, hoping to uncover shallow and mass graves containing the remains of their loved ones. They often begin their searches where the Attorney General's (AG) office claims to have already thoroughly explored. John Gibler, a freelance reporter who has written a detailed account of the events of the night of the disappearances, accompanied a group of these families as they searched blazing hot hillsides for evidence of mass graves. He told me that since the families began their searches in November, they have found 52 corpses and located scores more graves that still await excavation, some in areas where the AG had supposedly already searched. They continue to search the hillsides every Sunday. But the search for truth and justice has powerful enemies in Mexico. Just last week, Carmen Aristegui, the courageous investigative journalist, was fired after lending support to "Mexicoleaks", a new anonymous web portal designed to allow whistle blowers to safely provide information to a team of respected journalists. Aristegui's reports on military abuses and presidential-level corruption have been groundbreaking. The firing of Carmen Aristegui is a serious blow to the free press in Mexico and is being interpreted by many journalists as a harbinger of a further crackdown. It underlines why the families of the Ayotzinpa disappeared begin travel United States this week with the explicit goal of internationalizing support for their movement. The Ayotzinapa families make it very clear that the disappeared students from the Ayotzinapa College are neither the first, nor the last, victims of a system that has institutionalized complicity between authorities and criminal organizations. Like the victim families of the MPJD who caravanned across the United States in 2012, the Ayotzinapa families understand that the roots of Mexico's violence and impunity cross the northern border and are intertwined with the politics of the drug war. In a petition directed to U.S. officials, the families, teachers, and classmates of the disappeared students accuse the Mexican government, its military, and police of routinely violating the "human rights of its citizens through arbitrary arrest, torture, and even extrajudicial executions." They "call upon the Congress of the United States to halt all military and police assistance to Mexico until the Mexican government fully adheres to international human rights standards."